This rare subspecies of Anacamptis morio often occurs within colonies of other Green-winged Orchids. At first glance it is very similar to the Green-winged Orchid and has the same green-veined 'hood' formed by the sepals, but on closer inspection there are several important differences: the overall plant is rather spindly in appearance, the flower head is lax and with fewer individual flowers than are usually found on other Green-winged Orchids. It is, however, the lip that is very different; it is longitudinally folded, and although flushed with pink-purple on the outer margins, the centre has hardly any discernible markings or is completely white. This member of the Anacamptis morio (Green-winged Orchid) group of orchids occurs in the western Mediterranean region. It is most commonly found in the Iberian Peninsula, but its territory extends northwards as far as southern France. 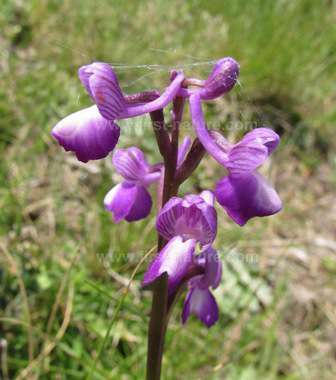 Orchids of the Anacamptis morio group are in steep decline in their traditional strongholds of old, unimproved meadows due to the excessive use of herbicides by the farming industry. 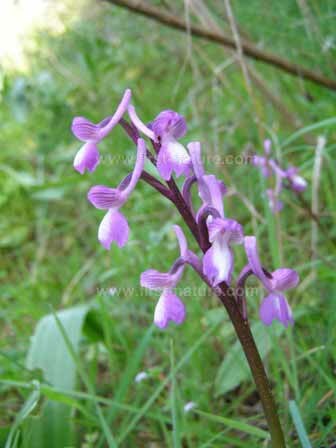 In the parts of the Mediterranean region where traditional farming methods are still used, it is possible to find large numbers of Green-winged orchids and their close relatives the Champagne Orchid and the Long-spurred Orchid Anacamptis longicornu. These specimens were photographed in the Algarve in Portugal during April.